More than 92 percent of multinational companies are focused on GDPR as a top priority1. ForeScout Technologies is one of them. 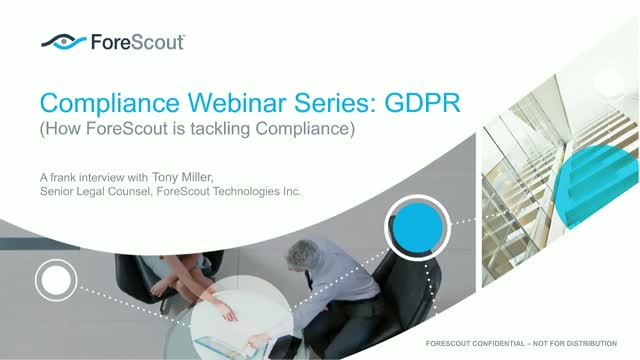 Tony Miller, Sr. Director of Legal Affairs at ForeScout shares lessons learned in ForeScout's quest to assure data privacy and become GDPR compliant. This informal event will be in the form of questions and answers. Tony Miller, Sr. Director of Legal Affairs & Jannine Mahone, Sr. Solutions Marketing Compliance, ForeScout Technologies Inc.
Join Erik Decker, Chief Information Security Officer and Chief Privacy Officer of the University of Chicago Medicine and Ellen Sundra, VP of Engineering at Forescout, to learn how to protect patients by applying the recommended principles and practices from Health Industry Cybersecurity Practices: Managing Threats and Protecting Patients (HICP). Over the past decade, threats to the health care industry has increased dramatically along with the sophistication of cyber-attacks. As a result, the Healthcare Sector Coordinating Council and the US Department of Health and Human Services collaborated to establish cybersecurity practices that can be used across the healthcare industry. Our guest, Erik Decker, serves as the industry lead on the development of, “Health Industry Cybersecurity Practices (HICP)”, which resulted from insights of the task group and over 150 health IT professionals. Ellen Sundra leads this discussion to gain insights into actionable steps that health industry IT and HTM security professionals can establish, implement and maintain in their organizations to thwart cyber-attacks before they occur. Is Zero Trust really achievable given the complexity in financial service organizations, especially considering limited staff, mergers and acquisitions and compliance pressures? With Phil Packman, a CISO at BT, as your host, learn from the founder of Zero Trust & Field CTO at Palo Alto Networks, John Kindervag, and the VP of Global Financial Services at Forescout, Tom Dolan, how your company can more easily embrace Zero Trust to proactively combat today’s high frequency and sophistication of cyberattacks. IT security teams are inundated with increasing numbers of security and compliance issues reported by security tools that either lack sufficient device context for prioritization or automation capabilities to enforce risk mitigation controls. As a result, highly skilled security teams waste time manually troubleshooting low-impact issues, unable to focus on proactive risk reduction or rapid threat response. Many organizations reliant on critical infrastructure networks are striving to reduce risk with cybersecurity strategies that bridge both IT and OT asset domains. However, achieving comprehensive IT/OT cybersecurity is often a more challenging task in practice than it is conceptually. Security professionals interested in effectively executing an integrated IT/OT cybersecurity strategy should join this webinar to learn how they can achieve end-to-end visibility into the full spectrum of both IT and OT network devices, as well as unified business risk management for today’s continuously evolving cyberthreat landscape. During this webinar, we will dive into four foundational elements of a comprehensive IT/OT cybersecurity strategy, including asset visibility, asset management, risk & compliance and investigation & response, with use cases of each. The Healthcare industry continues to be targeted by cyber threat actors. In 2018, large scale cybersecurity attacks caused disruptions in healthcare delivery, driving patient care operations to a grinding halt in several hospitals. Multiple breaches also exposed sensitive customer data for many thousands of individuals. Damages like these not only cost healthcare organizations billions of dollars, they can also hurt patient trust in the healthcare system and even risk lives. With limited security resources and budget, how should hospitals and healthcare providers approach cybersecurity to protect against current and future cyber threats? James John, Systems Engineer, ForeScout Technologies, Inc.
Michael Correa, Senior Engineer, ForeScout Technologies, Inc.
Leo Sheridan, Executive Liaison for Federal and Systems Integrators, ForeScout Technologies, Inc.
Brennen Reynolds, Senior Director Global Alliance Technology, ForeScout Technologies. What new and continuing threats are responders uncovering in investigations, and how are they dealing with those threats? This webcast will release results from the SANS 2018 Incident Response Survey, developed by Matt Bromiley, SANS Digital Forensics and Incident Response (IR) instructor and GIAC board member. Matt will examine how incident response teams are coping with organizational structures, resources and IR implementation in an ever-changing threat environment. - What staffing, services and resources are they using, and how are they using them? - Are they still struggling with a silo mentality between operations and response? - During an investigation, are they able to get the data they need to fully discover the attack's spread and remediate all traces? - How automated are these processes of data collection and discovery? The key to keeping your business secure is knowing all your assets and their potential security impact. The explosion of IoT, BYOD, guest and connected devices as a whole have expanded attack surfaces and introduced numerous blind spots and vulnerabilities that must be addressed. In this webcast, you will learn how you can reduce risk by streamlining security operations with automated device discovery, real-time asset management, continuous compliance enforcement and accelerated incident response and remediation workflows. Embedding security into business processes and employee awareness, particularly outside of information security teams, can be especially challenging. Yet security operations is vital to protecting the health, safety and intellectual property of any organization and therefore cannot operate in a silo. Learn how to apply a risk-based approach that leverages continuous visibility of devices and privileged accounts on heterogenous networks to enhance organizational trust and business success. Attendees of this webcast for higher education learned how the ForeScout Platform can identify and secure devices on a campus's network, without agents, and can help ensure that if they are connected, they are compliant and secure. Financial services firms are being challenged by three successive waves of challenges that have created the perfect storm for compliance, security and network professionals. In this webinar, Tom Dolan, Vice President of Sales for Financial Services will discuss how fast-changing regulatory requirements, advanced cybercriminals, and increasingly large and complex networks make compliance a top concern of financial services organizations. Grieving over a failed NAC program? It helps to talk about it—especially when you talk to experts. Learn best practices for a successful deployment and ways to get more value—and peace of mind—from someone who’s been through it before. Digital innovations are aggressively being introduced into public utilities and smart city operational technology (OT) infrastructure. This creates expanded attack surfaces that introduce enormous risk across a wide array of threat vectors. Yet, since OT environments were traditionally air-gapped, there has been less emphasis on cyber security. It is critical to discover and protect all device connections and profiles to defend against threats that can negatively affect business operations, data, and even citizen safety. Security best practices suggest the need to continually assess connected assets and enforce the right policies for controlled access, more granular network segmentation and immediate threat response. Watch this Carahsoft sponsored webcast to learn from ForeScout and Palo Alto Networks how you can use non-disruptive security techniques that achieve these core security principals while prioritizing uptime of operational networks and the safety of those involved. As innovation continues, so does the growth of connected devices on your network. Every IoT, BYOD and traditional IT connected device poses risk as a potential cyberattack threat vector. At the root of adaptive security operations is continuously discovering, classifying and assessing both managed and unmanaged devices and users as they gain network access from any entry point across tiers. Optimizing such visibility with rich contextual insight and automatically using that insight to dynamically detect, prioritize and respond to security incidents further accelerates adaptive security operations and reduces overall risk. Join us for an insightful webcast on how ForeScout and Splunk can help you achieve more adaptive security practices by orchestrating proactive closed loop workflows from discovery to remediation. This new SANS survey looks closely at the emergence and rapid growth of Industrial IoT (IIoT) systems, including broad-scale connectivity across industry and how well automation, critical control systems, digital/physical infrastructure and accompanying operations are protected against cybersecurity threats. Cyber leaders have a massive visibility problem that is only growing as the number of corporate unmanaged IP-connected devices continues to explode. Organizations are discovering up to 60 percent more devices on their network than previously known – amidst this rapid growth, where should CISOs and CIOs focus to increase their visibility, while at the same time manage and maintain security hygiene and compliance? Add to this, the expanded attack surface represented by non-traditional IoT and OT devices as entry points into the enterprise, and the challenge to prepare against threat actors seems overwhelming. In a rare opportunity to hear from an industry leader, join Dave DeWalt, former CEO of FireEye and McAfee, along with Rob McNutt, Vice President of Emerging Technologies at ForeScout, and Stuart Solomon, Chief Technology & Strategy Officer at Optiv, as they share insights and lessons on how today’s cyber leaders should be preparing for tomorrow’s expanded threats. In this new 2018 endpoint survey, publishing in association with the SANS DFIR Summit, SANS revisits threats, protections and response capabilities impacting endpoints. Results are presented in a two-part webcast series. The whitepaper and webcast developed from this survey are intended to promote better endpoint hygiene and provide valuable thought leadership to the community. Presented by: Tony Miller, Sr. Director of Legal Affairs & Jannine Mahone, Sr. Solutions Marketing Compliance, ForeScout Technologies Inc.